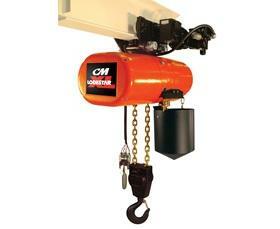 Chain hoists are used to lift and lower heavy loads of materials that are attached to the hoist by a lifting hook. There are several different types of chain hoists that can be tailored to suit your specific needs. Lifting capacity, length of travel, and the means of operation (manually operated, electrically operated, or pneumatically driven) can all be designed with the specific application in mind. The S. W. Betz Company has had significant experience with many different types of hoists and chain hoists. Some of these types are listed below. Lever Hoists – With capacities of up to nine tons, lever hoists can be used horizontally, vertically, inverted, or at any other angle to be able to lift and lower your materials with ease. Hand Chain Hoists – From hand chain hoists that focus on portability and durability, with capacities of up to five tons, to rugged, all-steel chain hoists, with capacities up to 100 tons, there are many different variations. Hoist Trolleys – Hoist trolleys run along beams to give different chain hoists added portability and mobility. Electric Chain Hoists – Motorized version of different hand chain hoists. Electric Belt Hoists – Good for clean room applications. Electric Wire Rope Hoists – Holds and transports loads of over 80 tons. The S. W. Betz Company has been distributing chain hoists and chain hoist equipment for over 80 years and has relationships with many of the top manufacturers in the industry including Harrington Hoists. If you are in need of or would like more information on any of our chain hoists and/or equipment, please contact us and one of our team members will be happy to assist you. For more information about Chain Hoists & Equipment or any other product or service from S.W. Betz, fill out and submit the form to the right.